Get Your Free Gift - JustPositionIt! Get Your Free Gift - JustPositionIt! Craft marketing messages that work like magic! If not, this FREE 4-step Worksheet is for you! 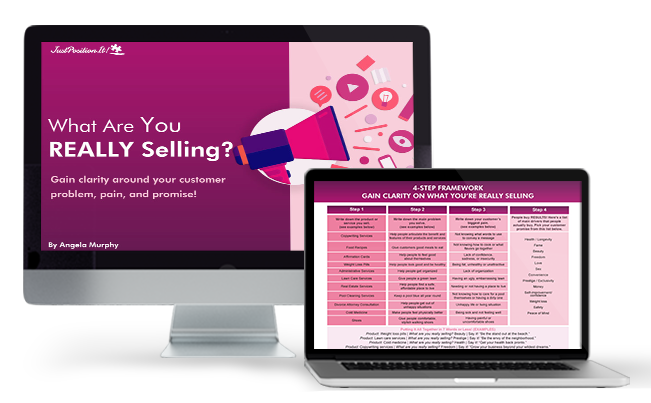 Getting to the bottom of what you’re REALLY selling can be tricky and over 90% get this wrong! As AMAZING as your services are, if you don't know how to accurately convey them, no one's going to buy from you. In order to know what you’re really selling, you must first start with the PROBLEM you solve. There’s a finite list of things that people ACTUALLY buy. Ready to gain clarity on the results your clients can expect? I hope so because the SUCCESS of your marketing depends on it.